Will the dog (and cat) protect us from its “crazy” cousin? Li repeated her liability disclaimer and then informed us that the medicine for a crazy dog bite is expensive at $200,000 dong (about $100) and that she was not responsible for paying the fee. 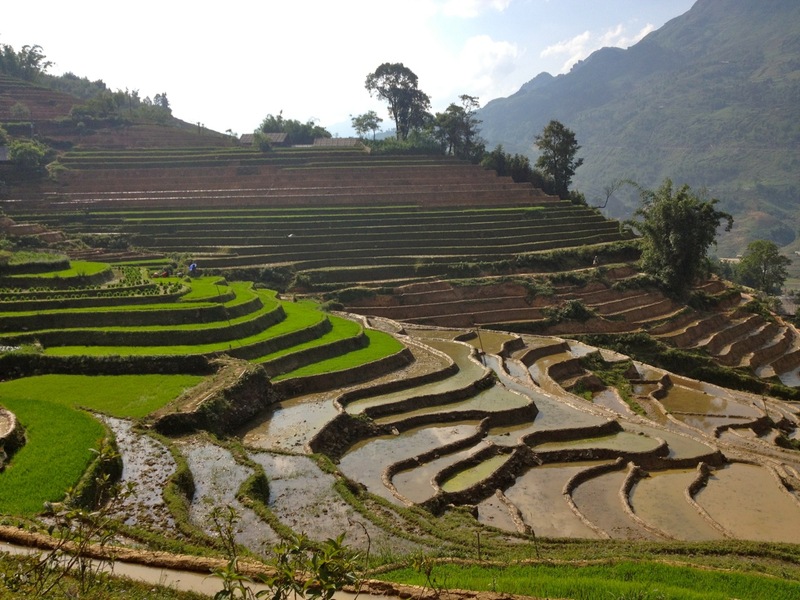 I think, for all of us, the cost wasn’t as much of a concern as was getting to the hospital in Sapa. It had taken the better part of the day just to get to our current location. And now that we were here, the open homestay, which, granted, was set on a hill, seemed fairly accessible to any deranged man, woman, child or creature on the loose and roaming the village. 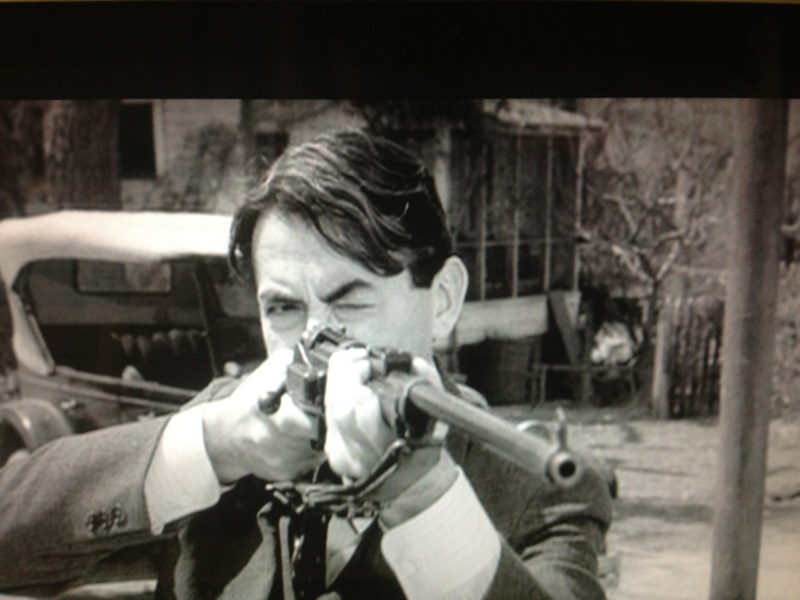 Atticus Finch (Gregory Peck) the best shot in Maycomb County. But actually, as a former English teacher, the first thought that went through my mind after hearing Li’s news was: we need Atticus “One-Shot” Finch, beloved father and the ultimate ethical lawyer of To Kill a Mockingbird, who, as a reluctant sharpshooter, ended up killing a “mad dog” stalking the streets of Maycomb, Alabama. He even accomplished this feat without wearing his glasses. This was a coming of age moment in the story for his son, Jem, who realized his “feeble” father actually had a talent and the courage to face anything. The second thought that ran through my mind was: this is the perfect opportunity to make s’mores! Since nobody was going anywhere. 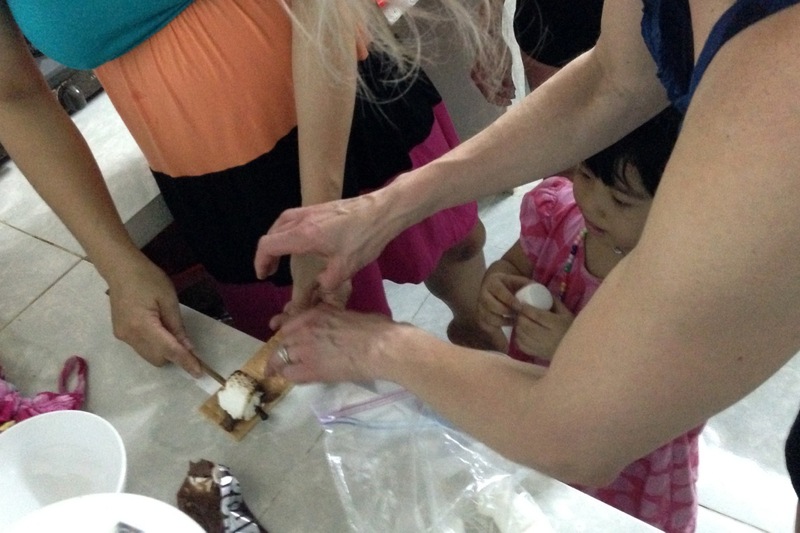 It had been my intention on this trip to not only introduce s’mores to Southeast Asia, but also to win the hearts and minds of the Vietnamese with graham crackers, chocolate and roasted marshmallows. So why not break out an American campfire favorite when hunkered down at a Hmong dwelling set among descending rice terraces near the Chinese border? At the time, I couldn’t think of a much better way (other than drinking loads of alcohol) to pass the time while trying to fend off an insane canine. It also was time to make the s’mores because the supplies could only take so much more transport in the heavy heat of Vietnam. 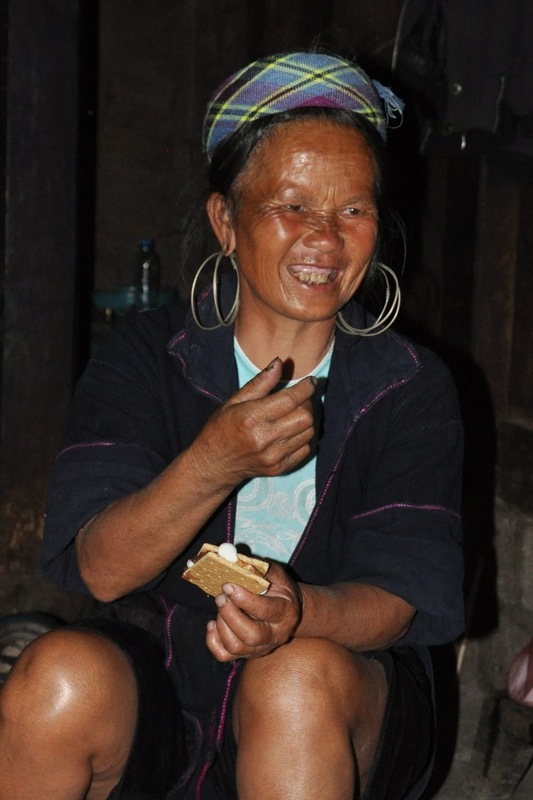 So far, two packs of graham crackers, a package of six Hershey’s chocolate bars and a bag of marshmallows had made it in my luggage through Ho Chi Minh City, Hoi An, Hue, Hanoi and now a remote mountainous area of Northern Vietnam. In Hoi An, I had even tested s’mores out with Silk, a Vietnamese friend who had arranged the entire itinerary in Vietnam for Debbie and me. Really, Silk was the primary reason I brought the ingredients. Before we left for Vietnam, she mentioned she was going to cook traditional Vietnamese meals and show us how to make fish sauce. Trying to think of something quintessentially American, or rather North American, that didn’t involve actual culinary knowledge and wasn’t a peanut butter and jelly sandwich, I decided on s’mores. These classic treats have been part of the ritual of camping for every American kid for nearly a century. In fact, the Girl Scouts credit themselves with the creation or at least the first recording of a s’mores recipe. 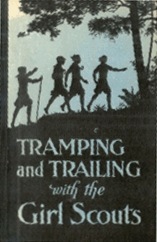 According to the Girl Scouts official blog, Loretta Scott Crew included the recipe in a 1927 publication, Tramping and Trailing with the Girl Scouts. 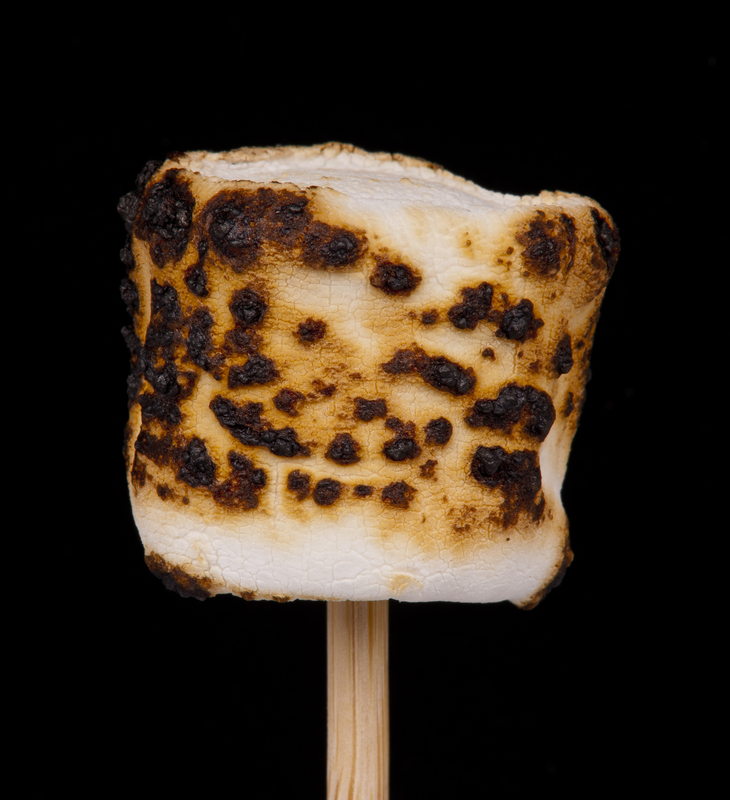 Roasting the marshmallow on a stick over a fire is the most important part of the process. One might choose to go with a marshmallow lightly roasted and tinged with a golden brown exterior or there is also Cajun style if you want it blackened and crispy. 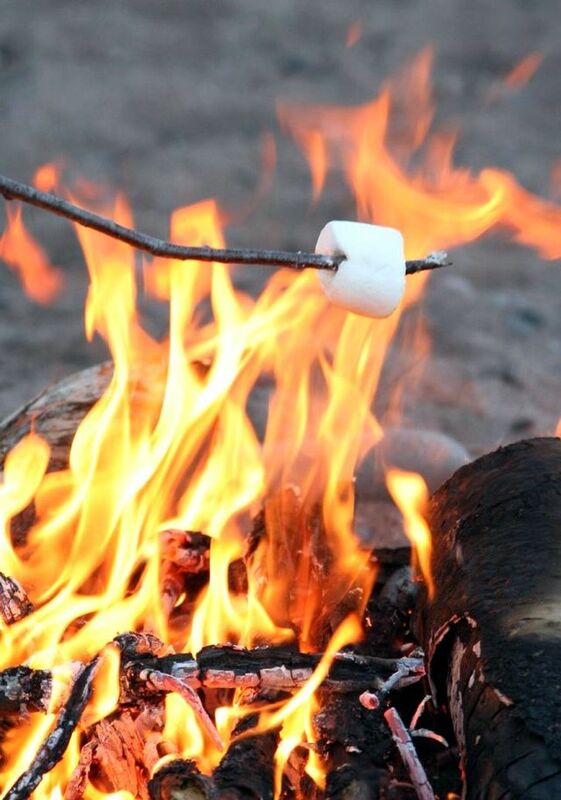 It appeals to everyone’s inner pyromanic when the marshmallow ignites in a sugar fueled flame. A charred bubbly pattern on the puff usually results. Of course the best part is placing the marshmallow on a slab of chocolate positioned in the middle of a graham cracker and then putting another graham cracker on top, smooshing the melty gooey innards of the marshmallow. 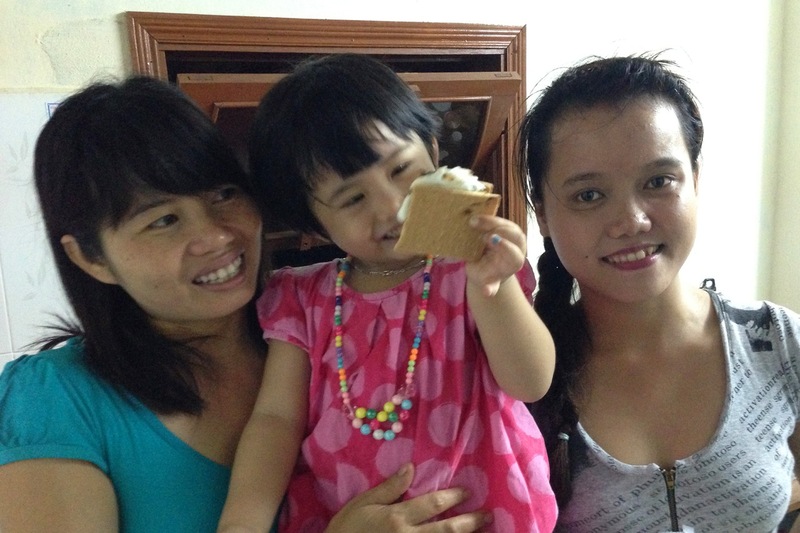 However, after showing Silk a marshmallow, which she held for a minute while turning it over and sniffing it, I knew the little puffy pillows of corn syrup, sugar dextrose, modified food starch, water, gelatin, natural and artificial flavor and tetrasodium pyrophosphate were a completely new phenomenon in Vietnam. While a campfire wasn’t an option, especially in the soggy Hoi An humidity that still dominated at 8 p.m., Silk did have a gas burner in her kitchen. And it turns out that chopsticks make the perfect roasting utensils. Silk fired up her gas burner and Debbie and I showed her how to put the marshmallow on. Silk’s daughter Billie jumped up and down, sensing something monumental was about to happen. Making the sandwich in Silk’s kitchen. Again, every kid has a streak of pyromania, and this seemed true with Billie who clapped her hands once the marshmallow caught on fire. I almost felt like I should try to juggle it with another fiery ball of sugar on a chopstick. It was a quick moment — no slow roasting, but the effect was the same. Billie turned the sandwich over and over and took a bite as well. While the sandwich part seemed to be a hit, the flaming marshmallows were the true sensation. We proceeded to torch a few more to the delight of Billie. 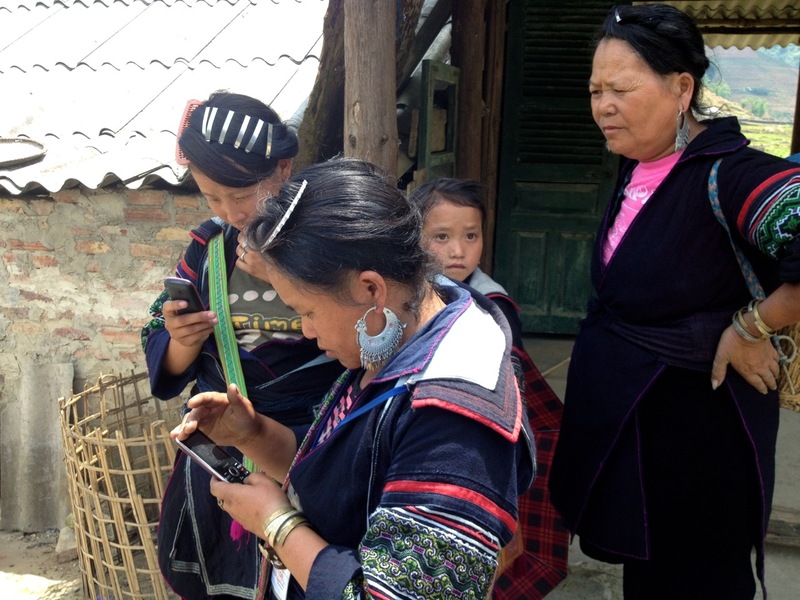 Despite experiencing success in Hoi An, I wasn’t sure what our Hmong family would think of the concoction. Li, who was leaving, approved my request to make s’mores, so I knew I had overcome at least one obstacle. Our hosts Sa, with her one month old baby at her side, and Hang, her husband, came in to the earthen kitchen to watch. Debbie, my faithful photographer and assembly forewoman took out several graham crackers and spread them with melted Hershey’s. Sa and her baby watch while I try and get the marshmallows ready. © Debbie Bacharach. Meanwhile, I asked for a chopstick and ripped apart some marshmallows that had fused together. The cooking pit in the middle of the dirt floor was perfect for the task. Hang stoked the low fire, and I held the marshmallows out. Without an open flame, the marshmallows took a bit longer, but they began the transformation, turning golden brown. Since Debbie and I were the only Americans in the group, several of our tour mates came in curious to check out the process. Sylvia, from Barcelona, was the first to request a s’more. Soon Lior from Israel, who was constantly hungry, wanted one. Even Cesar, our somewhat smug French companion wanted to try the American offering that would, of course, never compare to a French patisserie. But he wanted to give it a go, and perhaps that was because his attempt at buying opium from Li’s mother (another story) did not pan out. Sa’s son braves a s’more. © Debbie Bacharach. 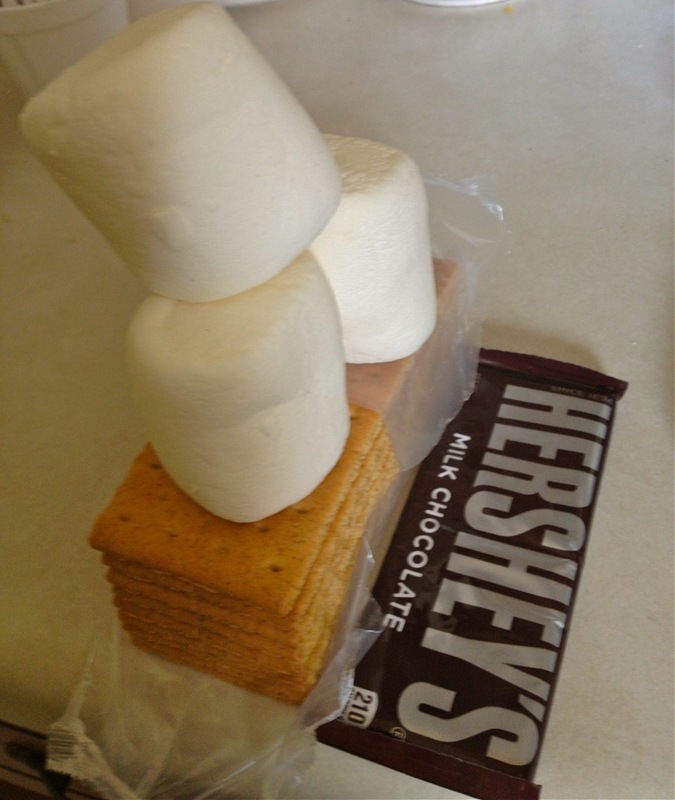 Wanting to impress Sa and Hang, I gave Sa the first s’more. Much like Silk, she smelled it and hesitated before taking a bite. While she didn’t finish the s’more, she smiled and said, “It’s good.” Then she handed the rest of the s’more to Hang. The son slowly approached and held out his hand. He turned the s’more over and over, examining its construction. Then he finally took a bite. Again a delayed reaction. Finally, a crooked crumby smile. He nodded, and then the next time I turned to look at him he had devoured the s’more. The grandmother approves. © Debbie Bacharach. Even the grandmother of the family sat down to sample one. I half expected her not to have teeth, but that assumption was dispelled when she laughed while trying to figure out how exactly to eat the treat. After the s’mores, we all moved on to the larger living room to drink rice wine and listen to music. Hang shut and locked the main door. 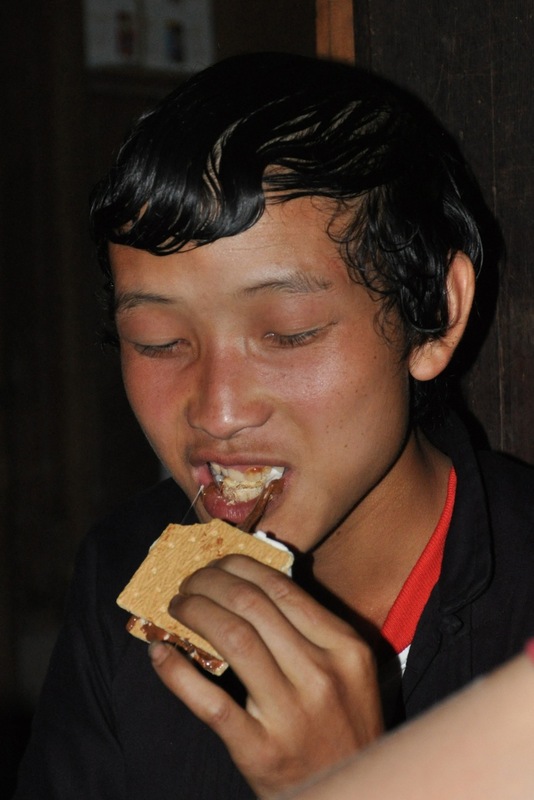 The s’mores, in my opinion, were an excellent distraction from wild imaginative thoughts of a rabid dog foaming and prowling about a remote village in Northern Vietnam. 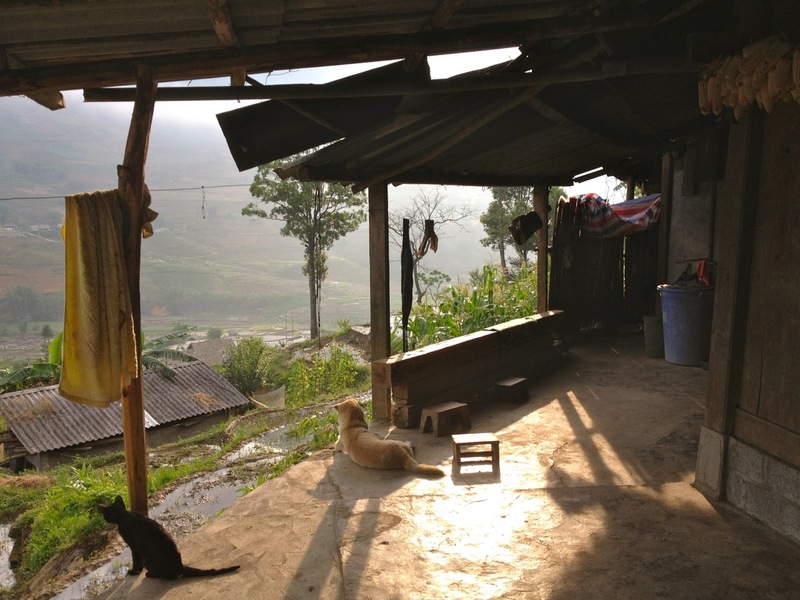 This entry was posted in Travel, Travel Humor, Travel Oops, Uncategorized, Vietnam and tagged Hmong homestay, roasting marshmallows, s'mores, Sapa, Vietnam by stephglaser. Bookmark the permalink. Spreading peace one s’more at a time. Thanks for reading! Yes, it was sort of an “I’d like to buy the world a Coke…” moment. If we could just all sit around a fire and roast marshmallows….